rec. St Barnabas, North Finchley, London, December 1984. DDD. The initial releases on the Eloquence label, Universal’s answer to Naxos, were almost all of very basic repertoire. Though there were some real gems to be found, such as the Curzon/Vienna Octet version of Schubert’s Trout Quintet, coupled with the Death and the Maiden Quartet (467 417-2), they came with the very barest details of the music and devoid of notes. As for the baroque repertoire, the original Eloquence catalogue contains decent but dated versions of Bach’s Brandenburg Concertos and Vivaldi’s Four Seasons, all from I Musici, and more recommendable discs of eight concertos from Vivaldi’s L’Estro Armonico under Neville Marriner (467 432-2), of music by Telemann, including the so-called ‘Water Music’ directed by Reinhard Goebel (469 664-2) and Goebel’s version of Bach’s Musical Offering rated by many as the best available (469 680-2). The best Handel on offer was the Sutherland/Bonynge Messiah. The intervention of Decca’s Australian wing changed matters with first a trickle and now almost a flood of reissues complete with decent sets of notes. At first available only as more expensive imports, these Australian Eloquence CDs are now becoming more widely available on-line and in the shops. A full catalogue is available. Tim Perry on this website in April strongly recommended a 2-CD Eloquence set of Schumann’s Concertante Works (442 8410) but there are also some excellent versions of baroque music to be had. One of the undoubted highlights from this source is the current disc of Handel’s Italian Cantatas – one of those CDs that I put on my shopping list twenty years ago, after reading enthusiastic reviews and hearing parts of it on Radio 3, but never got round to buying. Now the reissue is almost self-recommending: Emma Kirkby in delicious music and in prime voice, accompanied by the AAM under Christopher Hogwood, all at bargain price. I snapped it up as soon as I saw it – I’d probably happily listen to Emma Kirkby singing the telephone directory – and so will many others. With one possible exception, these are early works, written during Handel’s sojourn in Italy from 1706 to 1710, but if we were to scorn the works of this period we would be deprived of some fine music - Dixit Dominus to name but one. The crisply-played opening instrumental sonata of Tu fedel? – a 55-bar miniature-overture – serves as an excellent curtain-raiser for this cantata and sets the tone for the whole disc. When Emma Kirkby enters, the seal is set on the enterprise; the clarity of her singing is matched by the accompaniment and by the recording. She does not have to indulge in histrionics to convey the point of the words – if I have any criticism, it is that she might have put a little more venom into her scorn of the faithless Fileno who boasts of being faithful and true to her and a hundred others. ("Cento belle ami, Fileno, e poi vanti aver in seno un constante e fido cor.") Margherita Durstanti, who probably first sang this cantata, was known for expressing her fiery, spirited temperament in her singing. But then I am reminded that revenge is a dish best served cold and that the tone of the whole cantata is summed up in the final section, where she acknowledges that she cannot force Fileno to change ("Se non ti piace amarmi, forzar no poss’io") and resolves to leave him and look elsewhere ("Si, crudel, ti lascierò, novo amante troverò"). I have not heard Helen Watts version of this cantata on another Eloquence CD of Handel and Scarlatti Cantatas (461 596-2) but I should be very surprised if it proved superior to the Kirkby. Mi palpita il cor was probably written soon after Handel’s arrival in London, ‘borrowed’ with a new opening from an earlier work composed in Italy. It exists in three versions, of which the one for soprano and oboe (HWV132b, though the booklet does not specify) is performed here. Here Michel Piguet’s oboe makes an excellent foil to Kirkby’s delightful singing. Again one could imagine a more impassioned performance but that would militate against the spirit of the music: Handel is aiming to impress with the beauty of his music rather than express profound emotion. 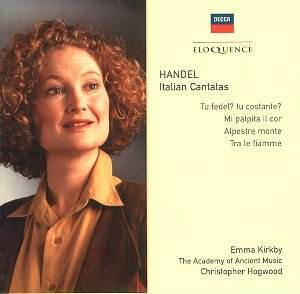 A CD of these two cantatas, albeit one using a different version of Mi palpita, for alto and flute, coupled with three other Handel cantatas, on the Tall Poppies label (TP173) was reviewed with reservations by Robert Hugill and with different reservations by Jonathan Woolf on this website. I cannot imagine from their reviews that they would prefer that CD to this, even forgetting the considerable price differential in favour of the Eloquence. The same qualities are to be found in the other cantatas. In the final work, sometimes referred to by the alternative title Il consiglio, good advice, detachment is almost mandatory – the text is, after all, a didactic one, by Cardinal Pamphili. The lover, drawn like a moth to the flame, is warned by the example of Icarus who flew too near to the sun; the wings which his father Daedalus had joined with wax melted, he fell into the sea and drowned. (If you want to jolt some long-forgotten Latin into life, look at Vergil’s wonderful account of this story in Æneid VI.14ff. or Ovid’s in Book VIII of Metamorphoses.) The warning is clearly spelled out: there is only one Daedalus – molti gli Icari son, Dedalo un solo – the rest of us had better not fly too high for fear of a fall. This is perhaps the most profound of these cantatas but here, too, the music’s attractions do not lie in its profundity: the fluttering accompaniment to the opening aria, matching the moth’s struggle in the flame is about as profound as it gets. This is not ‘great’ Handel but it is well worth hearing in such excellent performances. Both vocal and instrumental contributions may be labelled ‘authentic’ but this is not the kind of authenticity that intrudes on our modern enjoyment of the music. By 1984 the worst excesses of period-performance – ornamenting everything that moves in Handel and his contemporaries – had passed. Emma Kirkby, whose voice is particularly well suited to this repertoire, lightly ornaments her notes where appropriate and the accompaniment is equally stylish and accomplished. The recording is more than fit for purpose, with soloist and instrumentalists clear but not too forward and set in a suitably chamber-like ambience. The booklet lists the opening words of each section of each piece (twenty-two tracks for the four cantatas overall) and the informative booklet contains a summary of each piece – Anthony Hicks’s notes from the full-price original issue – but the summaries could have been more detailed and there are no texts. Kirkby’s diction is so pure that anyone with a decent command of Italian will not have much problem deciphering the words; nevertheless, in going one better than the European-sourced Eloquence CDs, why not go two better and emulate Naxos, who almost always provide full texts and translations, as also do Hyperion on their bargain Helios reissues? The score of Tu fedel? is available online as an adobe file at but I haven’t been able to find anything else. (Mi palpita and Alpestre monte are, in any case, given only in fragmentary form in the kind of older scores which appear on the web; only recently have complete manuscript versions of these come to light.) The text of Tra le fiamme is available at though attributed there to ‘anonimo’. Another small complaint: nowhere are the HWV catalogue numbers of these cantatas given; I had to look them up. These are, however, very small complaints to set against the great virtues of this CD. Those looking for more excellent recordings from this source will not regret buying Bach Cantatas 82, 159 and 170 with Janet Baker, etc, the Academy of St Martin and Neville Marriner (476 268-4). Also try Kirkby/AAM/Hogwood in Mozart’s Exultate Jubilate, etc. (476 746-0) and Mozart Arias (476 745-9); also the Kirkby/Rooley Purcell Songbook (476 746-7) and An Elizabethan Songbook (476 746-6). The Eloquence CD of Couperin’s Leçons de Ténèbres also received high praise when it was first issued at full price as recently as 2000. (Véronique Gens/Les Talens Lyriques, 476 245-4) Many of these have received strong recommendations from other reviewers on musicweb. Finally, I note that I am not the first to have reviewed this Handel disc for musicweb: I see that Robert Hugill was enthusiastic about it in November 2005, but a reminder of its virtues now might not come amiss. I agree with just about everything that Robert Hugill says, except that I think that the version of Mi palpita is HWV132b – he thinks it is 132a.